A close up of the large vase with a flowering plant. Also shown here is a printed and painted version of the pattern. A rectangular shaped earthenware platter printed in brown with the Rustic pattern. 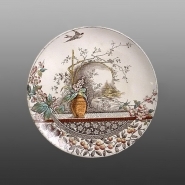 This pattern was registered in 1886 and is found in Burgess & Leigh's Print Record Book also showing a Hill Pottery back stamp as found on this platter. In atypical fashion, elements in the scene in the center cartouche break forth from the usual cartouche frame and bleed out into the rest of the scene. The river which almost bisects the scene and the distant buildings alongside the river bank in the background would seem to be a carryover from the Romantic movement, suggesting that this is very much a transitional piece. Framing the picture center left is a floral display in a large, patterned clay urn that sits on a patterned shelf and appears as the primary focus of the design. Below the shelf is another cartouche with one individual flower repeated in a sheet pattern. 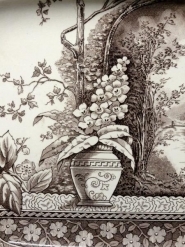 Below that is a partial border consisting of images of grapes and peaches. The pattern was also produced in a printed and painted version (see below) and in a single green color.